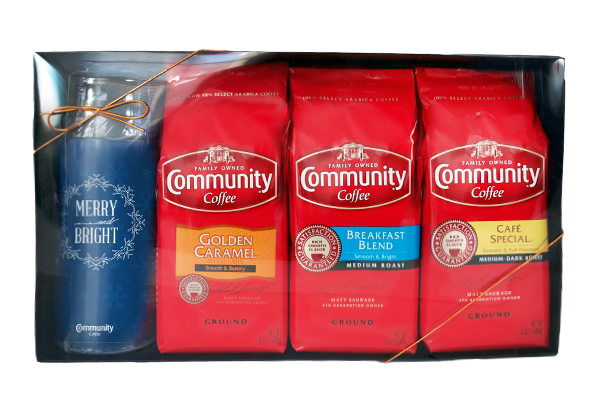 If you have a coffee lover on your list this year, Community Coffee Company and one of its gift sets is perfect for the coffee lover in every family. Community is the largest family-owned & operated coffee company in the U.S. and uses 100% Arabica beans for all its products, meaning they’re brewed with heart and taste delicious! A brand new holiday item this year is the Holiday Tumbler Coffee Set, which includes a festive tumbler and 3 of their ground blends: Breakfast Blend, Golden Caramel and Café Special. Add their newest holiday tumbler to your collection and stock up on your favorite blends with this gift set. Includes ground 12-ounce Breakfast Blend, Golden Caramel and Café Special® coffees, along with a holiday tumbler, all packed in a gift box. This set makes a great gift for any coffee lover on your list this year! You can purchase the Holiday Tumbler Coffee Set for $24.99 from the Community Coffee website. Community Coffee is generously offering THREE blends of their choice (in ground, whole bean or K-Cup) to a lucky winner!